In the aim of supporting various activities to help cultivate successors of traditional woodcut printing techniques, the foundation supervises the production of woodcut prints. Rather than simply preserving tradition, we hope to explore new possibilities for expression so that traditional woodcut printing will continue to develop as an attractive method of expression. Therefore, we are involved in the production of original contemporary works in woodcut prints as well as the reproduction of ukiyo-e prints. Since the start of the foundation, we have gained the support of prominent artists from Japan and abroad and supervised the production of numerous woodcut prints. The foundation supervises the reproduction of ukiyo-e prints by the Adachi Institute of Woodcut Prints, which is the parent organization of the foundation. Approximately 1,200 works from the early years of ukiyo-e to the end of the Edo Period have been reproduced, including masterpieces by such famous artists as Hokusai and Hiroshige. 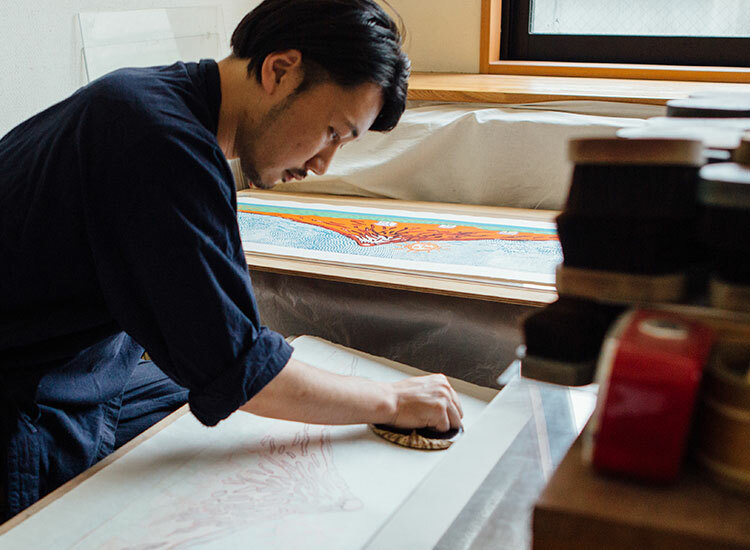 The foundation supervises the production of woodcut prints by numerous contemporary artists, including masters of Japanese paintings such as Kaii Higashiyama, Ikuo Hirayama and Matazo Kayama, who as special advisors supported the foundation in its early days, and more recently the internationally active Japanese artist Yayoi Kusama.